HE HACKS AND CHOPS THROUGH FLESH AND BONE!! Using the axe, scalpel and even an electric carving knife the "Savage Intruder" hacks his way through living flesh and bone. His twisted mind and animal cunning reach such a peek of depravity that even those with nerves of steel will tremble. This sick little psychotronic gem was written, produced and Directed by Donald Wolfe – stepson of the acclaimed British-born film producer Jeffrey Bernerd. 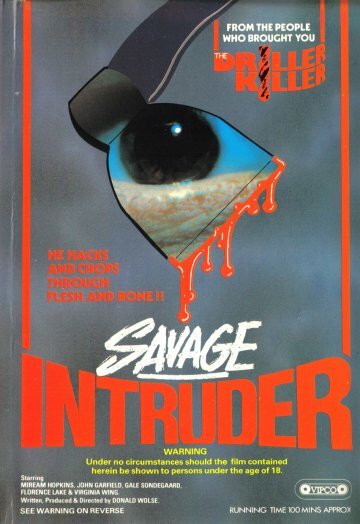 Wolfe’s independently produced Savage Intruder, as it is more popularly known, was actually his only full-length feature; until then having helped with just a handful of other film shorts. Produced by Congdon Productions, whom strangely didn’t follow this mildly entertaining horror oddity up with anything else, our story tells the chilling tale of Katherine Parker, an ageing actress (played by silver screen siren Miriam Hopkins), who lives a booze-fuelled reclusive existence, hidden away behind the walls of her strangely colourful mansion. Katherine’s surroundings, the morose and apathetic world of a seemingly run-down Hollywood, offer celeb hunter’s the fantastic opportunity to photograph her home, as slow moving tourist trains trundle by, just a short distance away outside. Enter Vic (played by “screen legend” John Garfield’s son, David), a young drifter, who hustles his way into her home whilst pretending to be a male nurse. Vic is far removed from the caring individual he pretends to be; in fact, as luck would have it, he’s a homicidal maniac who has been stalking the neighbourhood. And this sick menace has been very busy lately dismembering several women in the “Hollywood Hills” area! Originally touted as “A new high in terror and shock”, it was VIPCO’s December 1982 release however that trumped the lot: “He Hacks and Chops Through Flesh and Bone! !” of which a variation first appeared on the company’s release of Abel Ferrara’s outrageous (and infamously banned in the UK) Driller Killer, which was offered on tape in February of the same year. Interestingly, if you thought Driller Killer had a gruesome sleeve design, be sure to check out the US-based Unicorn Video’s “extremely graphic and violent” packaging, which made ample use of the dismemberment theme, featuring these highlights to disturbing effect! On a more sombre note, this was Ms. Hopkins’ final film, sadly passing away a few years later of a heart attack in New York City, just nine days before her 70th birthday.